Lightweight, breathable and barely visible neck brace; no more embarrassing bulky braces! This barely-there neck support brace offers unparalleled comfort and support, designed by experts! One third of us experience neck pain every year, often from injury after an accident or from playing sports. However, it’s easy to end up with neck and shoulder pain even if you haven’t had an injury. This can be both caused and aggravated by poor posture – many people end up with head forward posture from using computers and phones. This puts a huge amount of strain on your body; for every inch your neck moves forward an extra 10lb of weight gets put on your neck! The extra strain will build up over time to cause pain, while any injuries will take a lot longer to improve. When you have a soft tissue injury to your neck such as whiplash, you will be given a neck brace to help support your head as you recover. Neck posture braces are also useful for improving general posture as they force you to hold your head in the optimal position. However, they’re not exactly a fashion accessory! Wearing a big, bulky traditional neck brace can feel quite embarrassing as it’s so noticeable and unattractive. Finally, a neck posture brace that’s attractive, comfortable and functional! Bac< have totally redesigned the neck brace, creating a modern design that doesn’t just look a lot better than traditional braces; it’s much more effective too! Its open and lightweight structure is barely visible and far more comfortable as it lets your skin breathe and doesn’t constrict your neck. The chest plate at the bottom of the brace sits on your chest with no uncomfortable weight applied to your collar bone so you can breathe normally. It can be placed under your clothes so that it’s basically invisible. The top part of the brace sits just underneath your chin and features a soft and antimicrobial chin rest that will keep you supported and wonderfully pain-free all day. As an ingenious extra touch, Bac< have added a removable cool pad in the back of the Bac< neck brace so that you can enjoy the soothing and anti-inflammatory benefits of cold therapy. This brace has been designed in conjunction with the London Spine Clinic, one of the most visited clinics on London’s famous Harley Street. They recommend wearing the brace for 2-3 hours a day to relieve pain or to improve your posture while undertaking activities like reading and working on a computer. At StressNoMore we’re proud to stock the entire Bac< line of products. 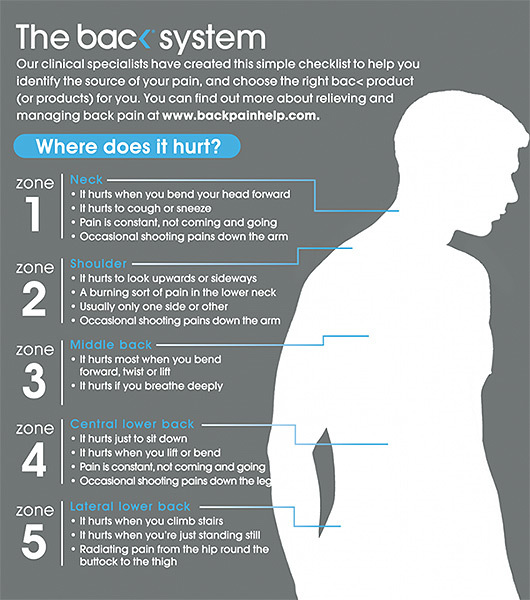 No matter what area of your back is causing you trouble, Bac< have a beautifully designed solution. Their products have been divided into 5 trouble zones; see which products correspond to yours using the graphic below and free yourself from pain!